NEW YORK (CNNMoney.com) -- Laws against using mobile devices to send and receive text messages while driving don't reduce crashes, according to a new study by the Highway Loss Data Institute. In fact, not only do bans fail to decrease crashes, they may slightly increase crash risk, the Institute said. Texting bans may only encourage drivers to hold the phone down low in the car, an HLDI spokeswoman said, making the behavior even riskier. "Texting bans haven't reduced crashes at all. In a perverse twist, crashes increased in 3 of the 4 states we studied after bans were enacted," said Adrian Lund, president of both HLDI and the related Insurance Institute for Highway Safety. Both groups are funded by the insurance industry. Researchers compared insurance claims data in the months before and after texting bans were enacted in California, Louisiana, Minnesota and Washington state. They also compared that information to data from neighboring states in which no such bans were ever enacted. Institute statisticians considered other unrelated factors that could have caused the increase in crashes, including ordinary month-to-month fluctuations. None accounted for the increases, the Institute said. "We were as surprised as anybody to find this out." said HLDI spokeswoman Anne Fleming. The federal government's National Highway Traffic Safety Administration, part of the Department of Transportation, criticized the Institute's study. "Distracted driving-related crashes killed nearly 5,500 people in 2009 and injured almost half a million more," LaHood said in a prepared statement. "Lives are at stake, and all the reputable research we have says that tough laws, good enforcement and increased public awareness will help put a stop to the deadly epidemic of distracted driving on our roads." The HLDI and NHTSA have been sparring in recent weeks with the privately funded Institute accusing NHTSA of devoting too much time and resources to the issue of texting while driving while not focusing enough on factors like drunk driving and speeding that cause far more deaths. The new study doesn't mean that texting while driving is safe, Institute spokeswoman Fleming said, only that current legislation isn't an effective way to deal with the problem. "We know this is a hazard," said Fleming. "It's just that, so far, the laws are not working." In an earlier study, Institute researchers found that laws banning hand-held phone use, likewise don't reduce crashes. Those laws didn't increase crash rates, though. Other laws governing what drivers do inside their cars, such as laws requiring seatbelt use, have proven to be effective, Fleming said, so researchers initially expected texting bans to be at least somewhat effective, too. But seatbelt use is easier to enforce because a shoulder belt can be seen from outside the car. A driver who is texting while driving in violation of a law may simply hold the phone down low and out of sight, Fleming said, making the behavior even riskier. Technology may hold some answers to the problem of texting while driving, Fleming said. 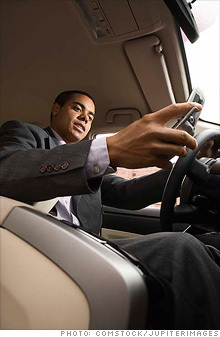 Software programs can restrict the use of texting features while a car is in motion. Also, some cars allow text messages to be read aloud and even allow drivers to compose or select text responses using their voice. That way, their eyes are at least on the road ahead. Voice texting may not be entirely effective, however, Fleming said. Research has found that voice calls, for example, are just as distracting even when a hands-free device is used. Will Toyota's Scion avoid Saturn's fate?